An HR department of one (HR DOO) is a generalist, a problem-solver, a multi-tasker, a recruiter, trainer, employee relations specialist, benefits administrator, CHRO. They wear all the hats. 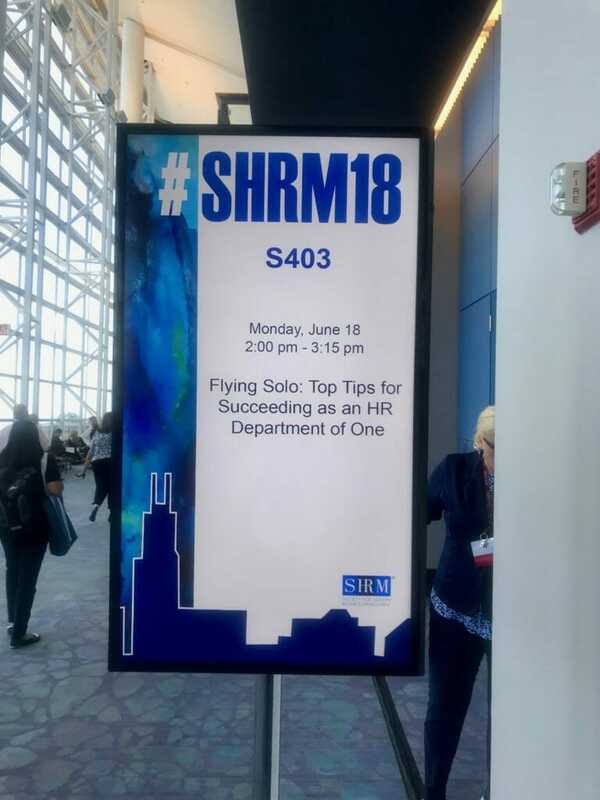 As I sat on the ground in the front left corner (we’d run out of seats), in the #SHRM18 session given by Amanda Haddaway, I couldn’t believe how many HR DOO’s there were in that session alone! The room was overflowing, and a satellite room was opened for HR DOO’s to listen to the presentation. I was excited to learn about the challenges facing this department. It was nice to learn a little bit about Amanda before jumping in. She’s been in the HR profession for 11 years, she’s an only child (like me), and she found herself in the role accidentally. And like the HR professionals in her shoes filling the auditorium, she’s spent many years faced with the struggles of working as an HR DOO. Harvard Business Review found that in one larger company, their weekly executive meeting consumed 300,000 hours per year. Adobe found that we spend an average of 1 hour checking our work email each day. That’s 16+ years of your career spent on email alone! Not taking anything away from the HR DOO here, but I think time management is something we can all improve upon. The question, “do ya have a minute?” Can sometimes be detrimental to the productivity of your day! We talk more about this in our blog here. What are my distractors and time wasters? This one’s a biggie. There’s the FLSA, ADA, FMLA, EEO, ADEA, ACA… need I go on? The HR DOO has a lot to manage! Not just that, but there is a high cost associated with non-compliance with any of these agencies. Where do I have employees located? What are the federal, state and local laws that pertain to my business size and industry? And P.S., if you’re a SHRM member don’t know the answer to any given question, you can go to SHRM Connect for help! 74% of senior executives identified the digitization of HR as a top priority. Woohoo! That’s where we (Viventium) come in (shameless plug, sorry). But seriously, our whole purpose is to offer you a service with impeccable design that will make your day-to-day easier. From ATS, to personnel files, to timekeeping, payroll, employee self-service, and beyond, we are here to make your life easier, free up some time, and keep you in compliance! I know that sometimes new technology can be intimidating. But this is worth it! And the SHRM conference is a great way to meet and greet with vendors. And grab some swag, or maybe even have a magical experience! What are the essential features I must have? Amanda quoted Johnny C. Taylor, SHRM CEO, in saying “We must dream about building inclusive workplace cultures. We must lead workforce readiness. We must elevate the profession.” With all that the HR DOO’s have going on, it can be easy to forget that they are here to progress and elevate themselves as much as the next person. As a young professional, this is something I identify with at my core. Amanda referenced another quote that is one of my favorites, “no one cares more about your career than you do.” I love this quote and it’s the truth! You better be respecting your own time, putting in the work, and keeping your eyes on the prize. Because guess what? No one else is going to do it for you! HR DOO’s, don’t forget about you! What does success look like in my position? What are my goals and success metrics? So now that we know all of this, how can we implement it back at the office? Let’s use The Sanity System: Plan, Prepare, Streamline, Go Forward. Plan your time accordingly so you are not bogged down by unnecessary emails and tasks. Prepare your company for any compliance challenges that may lay ahead. Streamline your processes using technology. Go forward and do the best that you can! Here’s some good news, and we were the first group to learn this fact… SHRM has announced the development of a new HR Department of One Specialty Credential. They are still working on the details, but for any HR DOO’s out there, you can email isd@shrm.org with feedback and what you think should be included. Being an HR DOO is certainly overwhelming, but by asking yourself the right questions, you can find a way to successfully juggle all the hats you need to wear.